There really have not been too many sets of brothers who made significant marks as members of the Boston Red Sox. Most modern day fans have of course heard of the Conigliaro boys, Tony and his younger brother Billy. Then there was the Hall-of-Fame catcher Rick Farrell and his brother, the pitcher Wes, who while pitching to his older sibling became a two-time twenty-game-winner with Boston back in the thirties. And then there were the Johnson boys, Indian Bob and his older brother, today’s featured birthday celebrant, Roy. Both started in the Red Sox outfield but not at the same time. 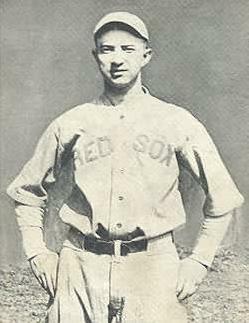 Bob played for Boston for two seasons at the very end of his big league career, in 1944 and ’45. 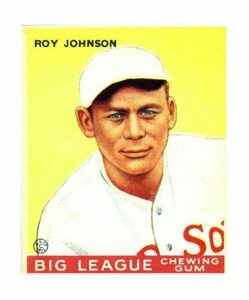 Roy joined the Red Sox in 1932 after spending his first four big league seasons in Detroit. He started in right field for the 1933, 34 and ’35 Boston teams. He batted over .300 in each of those seasons and drove in a career high 119 RBIs in 1934. When that RBI number fell to 66 the following year, Boston GM Eddie Collins took $75,000 of Tom Yawkey’s money and went out and got Doc Cramer from Collins’ old team, the A’s to play right field and traded Johnson to the Yankees. Two years later, he would return to Beantown and play his final season as a member of the National League Bee’s (later called the Braves.) This part Cherokee Indian from Oklahoma retired with a .296 lifetime batting average. His younger brother would later leave the big leagues with the same exact lifetime average. This great catcher, also born on February 23rd, also played for both the Yankees and Red Sox.